On the north side of the peninsular Malaysia are the 2 beautiful Perhentian Islands: Perhentian Besar (big) and Perhentian Kecil (small). 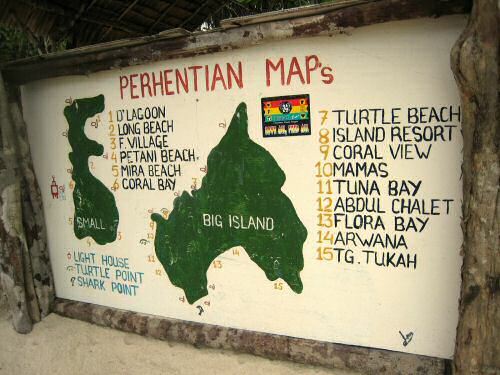 How to get to the Perhentian Islands. Normally you would first travel to Kota Bharu or Kuala Terengganu. From there take a bus or nook a taxi to Kuala Besut: a little fishing village where boats will take you to the islands that are about 20 km off the coast. Kuala Besut is an hour's drive from Kota Bharu and a 2 hours drive from Kuala Terengganu. At its small harbor, you can buy tickets for the boat, but you can also purchase your tickets at the airports of Kota Bharu and Kuala Terengganu (although the prices at the airport are higher than in Kuala Besut). Just do note that when weather conditions are bad, the boats will not sail out, chances of bad weather in the tropics increase after midday, so to be on the safe side, try to book a morning trip. Both islands offer quite a few accommodations from resorts with airconditioning to very basic lodges without air conditioning. There is no freshwater Perhentian, so do you shower in filtered salt water. There aren't any internationally known hotels, so if your in for pampering, you better go to nearby Redang Island. There isn't much to say really about accommodation and food: Perhentian is first and foremost a place to enjoy diving and snorkeling. Perhentian Kecil is mostly frequented by backpackers and is crowded, with their best resort being Tuna Bay. The better resorts however are on Perhentian Besar, like the Perhentian Island Resort. However, do know that the food in the Perhentian Island Resort is way overpriced: it's your typical Malaysian cuisine that you can find anywhere on the island for much cheaper prices. Do bring a torchlight though, as walking from the Resort to the rest of the island crosses quite a scary, dark, staircase in decline. The monsoon season is between October and March: most of the resorts will close because of the really bad weather. Perhentian is a true diving and snorkeling paradise. Just like Pulau Redang, it is situated in the Terengganu Marine Park. 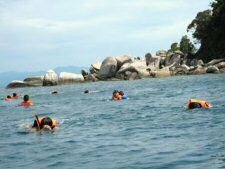 Unlike Redang, Perhentian is more flat and therefore more suitable for snorkeling, as the waters around the island are quite shallow and various resorts in Perhentian have their own house reef. The fishes on these house reefs will come towards you, hoping to be fed. It is advised not to feed them as they aren't bread eaters. Do know that the corals are deteriorating fast, so the best way to find secluded snorkeling spots is to rent a boat for a day or a canoe and peddle around the island by yourself. A nice spot for snorkeling that is reachable by boat-taxi is the so called Shark Point. The secret is that there are no sharks, but the water is quite deep: it's not possible to step on corals and the amount of fishes is just amazing. The beaches of Perhentian Kecil are very small and don't be surprised to find an empty plastic bottle here and there: a far cry from what you would expect from a Marine Park. However the island is by far more lively than its bigger brother. On the right side of the Perhentian Island Resort, you have very good snorkeling, less crowd and you could spot grazing turtles. 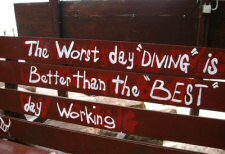 For about RM1000 (330 USD) you can get your diving PADI on the Perhentian Islands, but you do need to stay at least 5 days. Highly recommended though!